The Georgian Church has a very long history in the Holy Land. Iberia and Colchis were within the Roman Empire at the time of Christ’s Resurrection, and small communities of Georgians lived in most large cities of the Mediterranean region. Three of the Apostles are known to have evangelised in Georgia (Saints Andrew, Simon the Zealot and Matthias, of the Seventy) but little is known of their local supporters. When the Church ruled that Gentiles should be freely admitted to the faith without first submitting to circumcision and becoming Jewish, the Christian faith rapidly spread amongst the Greek and Latin speaking communities of the Mediterranean, including the Georgian communities of that region. After Constantine the Great’s conversion to Christianity early in the 4th century, he had a site in Jerusalem consecrated for the establishment of a monastery, and upon the conversion of King Mirian of Iberia to Christianity in 327, presented it to the Georgians for the use of their countrymen in the Holy City. The site is located It is located in the Valley of the Cross, below the Israel Museum and the Knesset. The current Jvari Monastery (The Monastery of the Holy Cross) in Jerusalem dates back to the 11th century; there are some remnants of the original 5th century structure intact within this more modern structure. The Georgian Church in Palestine suffered financial difficulties in the 17th century, as both Palestine and Georgia were under Muslim occupation and the Church was suffering many constraints. 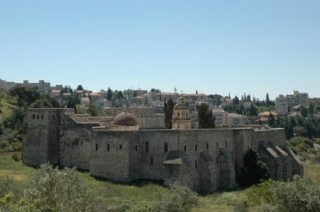 As a result of these difficulties, the Jvari Monastery was sold to the Patriarchate of Jerusalem, which continues to administer and operate the monastery to this day. Last year negotiations between the Georgian government and the Patriarchate of Jerusalem allegedly commenced regarding the return of this monastery to the Georgian Church. This video filmed by a group of Russian Orthodox pilgrims from America provides an interesting overview of the monastery. February 25 is the Feast of Saint Prokhore of the Georgian, Saint Luka of Jerusalem and Saint Nikoloz Dvali, all of whom were intimately associated with this monastery. The Feast also celebrates all the Georgian clergy who have served in Jerusalem over the centuries. ” Saint Prokhore the Georgian, a descendant of the noble Shavteli family, was born at the end of the 10th century and grew up in a monastery. When he reached manhood he was ordained a hieromonk and labored for one year at the Lavra of Saint Sabbas in Jerusalem. Then, with the blessing of his spiritual father Ekvtime Grdzeli, he began the reconstruction of the Holy Cross Georgian Monastery near Jerusalem. Finally, in the 11th century, King Bagrat Kuropalates offered much of his wealth to Father Prokhore for the restoration of the monastery. Saint Prokhore beautified the monastery, then gathered eighty monks and established the typicon (the monastic rule) for the community in accordance with that of the Saint Sabbas Lavra. When Saint Prokhore had labored long and lived to an advanced age, he chose his disciple Giorgi to be the monastery’s next abbot. Beyond this, little is known about the life of Saint Prokhore. 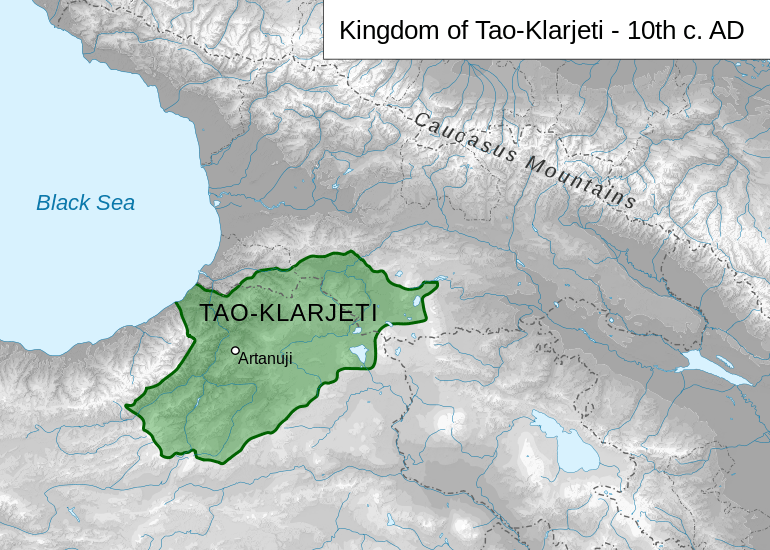 According to Georgian researchers and scholars, he was probably born sometime between 985 and 990. He spent the years 1010 to 1015 in Jerusalem, and labored at the Lavra of St. Sabbas until 1025. He reposed in the year 1066, between the ages of 76 and 81. But the devil was envious of the holy father and provoked a certain Shekh-Khidar, an influential Persian at the court of Sultan Penducht, (Probably Sultan Zakhir-Rukedin-Baibars-Bundukdar of Egypt (1260–1277)) to take up arms against St. Luka. Sultan Penducht then transferred possession of the Holy CrossMonastery to Shekh-Khidar, who “treated the Georgian monks in a beastly manner and finally ousted them from the monastery altogether.” Fulfilling his God-given duty, the blessed Luka insisted on personally confronting Shekh-Khidar in defense of his brotherhood. Luka’s Christian brothers and sisters warned him, saying, “Shekh-Khidar is threatening you.… Flee and hide fromhim!” But Luka paid no heed to their admonitions, certain that it was more fitting to die for Christ than to live for the world. As he had insisted, he himself approached Shekh-Khidar and asked for the release of the imprisoned fathers. Accordingly, Saint Nikoloz returned to Jerusalem, met the monk whom God had appointed, and informed him of what had been revealed. The Most Holy Theotokos and Saint John the Baptist appeared to St. Nikoloz’s spiritual father, who had been praying intensely for guidance, and told him that it was the Lord’s will for Nikoloz to journey to Damascus. While in Damascus, the holy father entered a mosque and openly confessed Christ to be the Savior, reproving those present for their folly. The angry Muslims seized Saint Nikoloz, beat him, and cast him into prison. After a great struggle, the metropolitan and local Christians succeeded in recovering him from captivity, but he immediately returned to the Muslims and began again to denounce their ungodly ways. Again they beat him mercilessly, lashed him five hundred times, and cast him in prison for a second time. But the holy martyr’s wounds were healed through the miraculous intercession of St. John the Baptist, and after two months he was released from prison. From “Lives of the Georgian Saints” by Archpriest Zakaraia Machitadze, Saint Hermanns Press.